Northern Rail is the main railway franchise in South Yorkshire and the surrounding area. Currently it is operated between two companies; Serco; an outsourcing company which does practically everything and is often criticised for doing poor work; and Abellio; the international arm of the main railway organisation in The Netherlands. Usually I find Northern Rail quite good (or, as good as they can be given the railway network in England). But in Summer 2014, I had a run in with one of their Revenue Protection Inspectors. It is quite common for staff in this role to be rude, violent, offensive, have no common sense, and no respect for their paying customers. The particular member of staff I dealt with seemed to lack English skills (I'm pretty sure he was foreign). His only vocabulary seemed to consist of tickets tickets tickets and I work for train company. He was unable to form questions, and was only too happy to grab hold of me and shout at me. In most industries, you will get sacked for this kind of behavior, but it is quite common amongst Revenue Protection Inspectors, and isn't restricted to Northern Rail. 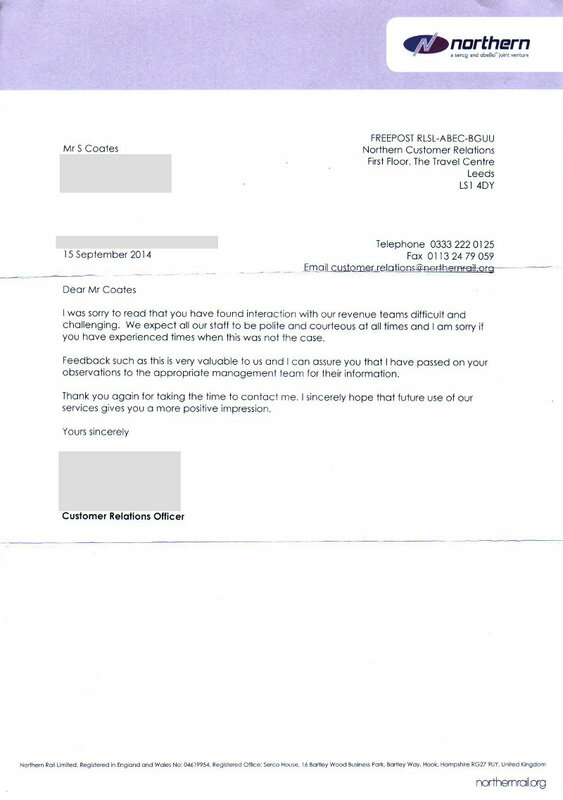 I have had run ins with Revenue Protection Inspectors before, so this was not the first time. This is something I feel very strongly about, and I have not felt confident enough to use the railways since this incident.